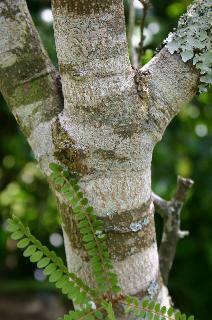 There are 30 species.of Sophora found in temperate and subtropical regions of both Hemispheres. The New Zealand species are endemic. There is debate as to their correct botanical classification. There are 2 common trees; and species status has been given to a number of distinct divaricating shrubs, confined to localisedareas within New Zealand . All are deciduous. Sophora tetraptera is a tree up to 12 metres tall. Leaves can be up to 15 cm long with leaflets 3.5 X 8mm. The golden yellow flowers are up to 5 cm long. There is no divaricating juvenile form. Its distribution is on lowland stream sides and forest margins on the eastern side of both islands. Sophora microphylla is a tree to about 10 metres tall. Leaves are up to 15 cm long, however what differentiates it from Sophora tetrapetera, is the small leaflets are never longer than 1 cm. The flowers are slightly smaller as well and are coloured pale to golden yellow. It may have a divaricating juvenile form. Its distribution is through all of New Zealand in lowland and lower montane forests, along rivers, forest skirts and open places. 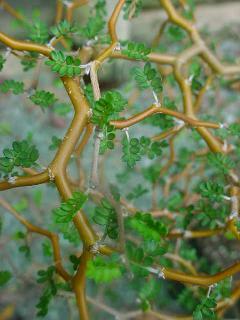 Sophora prostrata is a prostrate or bushy shrub up to 2 metres tall. Leaves may be up to 2.5 cm log, usually smaller. Leaflets are no larger than 4mm. Kowhai is another of New Zealand ’s deciduous trees, actually termed hemideciduous. It loses its leaves just prior to flowerin. In August and September the flowers arise from branches naked of leaf. All New Zealanders who live close to nature welcome the kowhai flowers, as they signal the arrival of spring. 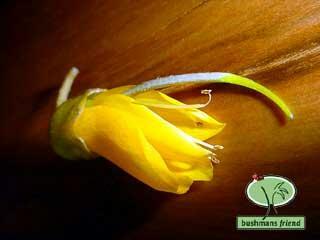 The flower of the kowhai is the national flower of New Zealand. Like all legumes Kowhai have bacterial nodules on their roots that transfer gaseous nitrogen into soil soluble nitrates, an excellent fertiliser. Note the similarity of the seed pod to the other legumes peas and beans. The seed is adapted for dispersal by floating which accounts for its abundance on stream sides, where floods carry the seeds throughout the catchments system. Native birds such as pigeon feed on the seed pods using the tough seeds as gizzard stones to masticate their food. Pigeons have been observed eating the leaf as well. The seeds of kowhai have a dormancy mechanism, that being, their tough seed coat (testa) that is impervious to water unless nicked with a sharp knife or scalpel. Soak overnight and sow in a warm, sunny spot. Germination should proceed within 20 days. A plant 30-40 cm high can be attained one year after germination. P. Williams Te rongoa maori. The Kowai is met with principally on the banks of rivers: In the season of spring this tree makes a beautiful appearance , being entirely covered with bright chrome or golden coloured flowers which hang corymbriated, and succeeded by long pendulated pods, the especial food of the Tui and other birds. Its beauty is not dimmed by the reflection in the adjacent stream. J. Polack. New Zealand : being a narrative of travels and adventure in that country between the years 1831 and 1837. 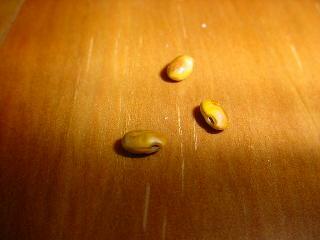 The seed of Sophora microphylla with their tough testa or seed coat. Kowhai is the national flower of New Zealand. The seeds of this genus have a dormancy mechanism, that being their tough seed coat (testa) that is impervious to water unless nicked with a sharp knife or scalpel. The smaller seeded species do not need this treatment as the seed coat is thin and diffusion of water and gases occurs readily. Soak overnight and sow in a warm, light spot. 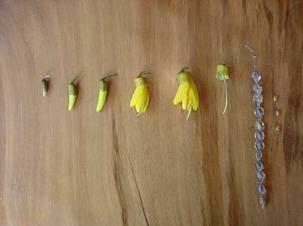 Kowhai are simple for children to grow and observe. The change from flower to seed pod over a summer is noticeable and striking and with their high germination rate and hardy nature they make excellent studies for students of all ages. In the wild the seed, which floats, can be seen washed up on beaches after a storm. They are also eaten by birds, probably as roughage. Their journey through the acid environment of the gut dissolves away some of the testa and is an aid to germination. kowhai make excellent plant studies for students of all ages.